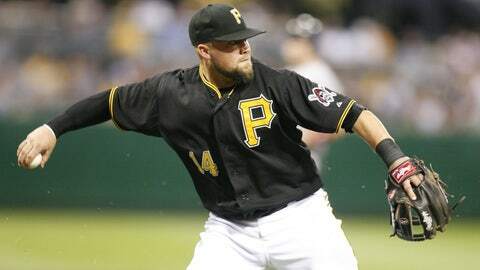 Casey McGehee, who spent last season playing in Japan, has played with the Cubs, Brewers Pirates and Yankees. After weeks of tossing names around, the Marlins decided on a third baseman, signing Casey McGehee to a one-year deal Wednesday afternoon. According to president of baseball operations Michael Hill, the club left the winter meetings in Orlando believing it was in its best interest to pursue McGehee rather than acquiring a third-base candidate via trade and giving up young pitching. Hill had spoken to a number of sources and contacts in Japan who were able to see McGehee play in the Pacific League of Nippon Professional Baseball and offered positive evaluations. McGehee played for Tohoku Rakuten last season, batting .292 with 28 home runs, 30 doubles and 93 RBI in 144 regular-season games. The 31-year-old hit .289 in 11 postseason games for the Golden Eagles, who beat Yomiuri in the Japan Series for their first championship. Prior to his stint in Japan, McGehee spent parts of five seasons in the Majors with the Cubs, Brewers, Pirates and Yankees. Selected in the 10th round of the 2003 draft by the Cubs, he made his big-league debut as a September call-up in 2008. The Brewers claimed him off waivers that offseason. McGehee averaged 17 homers and 79 RBI in three seasons with Milwaukee from 2009-11, including a career year in 2010 when he hit .285 with 23 home runs and 104 RBI in 157 games. In 2012, he totaled nine homers and 41 RBI in 114 games between Pittsburgh and New York, spending just two months with the Yankees. Miami entered the hot stove season looking for a stopgap for Colin Moran, who hit .230 with three doubles and 10 RBI in 22 games in the Arizona Fall League. The 21-year-old was selected sixth overall in this year’s draft out of the University of North Carolina. Earlier this offseason the Marlins signed veteran free agents Jarrod Saltalamacchia, Rafael Furcal and Garrett Jones to fill holes at catcher, second base and first base, respectively. Last week Miami made a couple of deals, acquiring right-handed reliever Carter Capps from the Mariners for Logan Morrison and outfielder Brian Bogusevic from the Cubs for Justin Ruggiano. In a corresponding move to free up space on the 40-man roster, the Marlins designated catcher Kyle Skipworth, a former first-round pick, for assignment.